Come join our yoga community! This is much more than yoga poses! 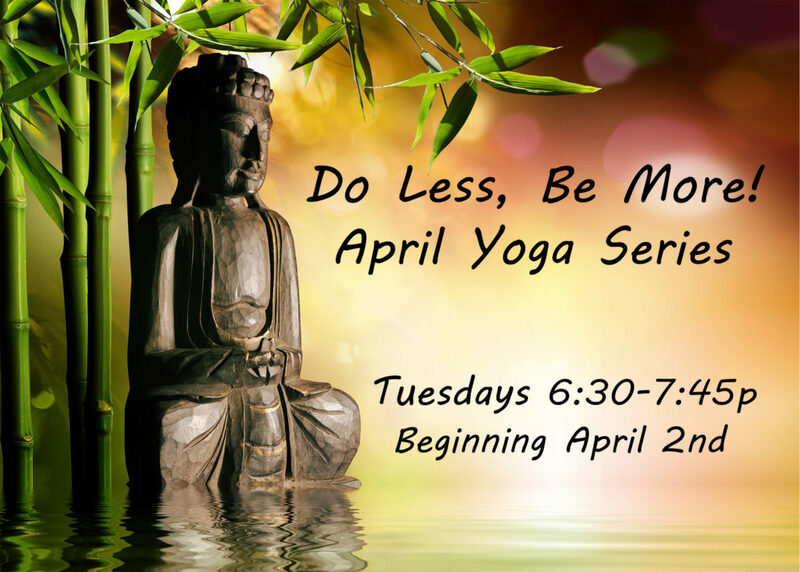 Our class consists of breath work, gentle, easy poses to give you a good stretch, meditation and relaxation. The main focus of our time together is to help you connect your mind, body and Spirit by slowing down. Come connect, unwind and relax! All levels welcome. No experience necessary. This is a non-competitive, welcoming yoga experience. Come get what YOU need! Tina Walsh is a skilled teacher with 20-years experience. She is versed in many schools of yoga and brings a depth and understanding of nervous system healing with 12-years of study in body-centered psychotherapy. In addition to yoga, Tina offers Counseling, Massage Therapy, Reiki and Travel. Sign-up for 8 Week Series! Have a friend that would love this class? Refer a friend that’s new to Lighten-Up Wellness Yoga and get a free class ($17 taken off the price of the series)! Share the love! Private Yoga Instruction encompasses breath work, postures, meditation, and relaxation tailored to your specific needs. Can Yoga help me with my anxiety? Yes, Yoga helps reduce anxiety. Research indicates that anxiety is created when your energy is held in the upper part of your body. Through the use of breath work, movement, and relaxation, yoga helps you to ground your energy. When your energy is more grounded, your anxiety lessens tremendously. I have no flexibility, do you think I can do Yoga? Absolutely! I always tell my students, if you can breathe, you can do yoga. While that may strike you as funny, it is true. The practice of yoga allows us to begin wherever we are. This is the beauty of yoga. Can Yoga benefit emotional crisis? Yoga can help with emotional crisis by helping you create internal supports, including feeling safe in your body no matter what crisis you are in. Also by helping to create a practice of mindfulness wherein you learn to be present in the current moment to help diminish feelings of being overwhelmed. Tina’s classes help me achieve my goal of ultimate health in mind and body. The power of movement, breathing and meditation have far reaching benefits.